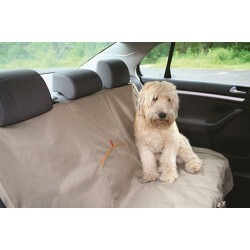 Protect your car seat from pet hair and slobber with pet seat covers, cargo covers, or the Kurgo Wander Hammock. The Kurgo Bench Seat Cover measures 53" W x 45" L. The Kurgo Bench Seat Cover not only keeps your se.. The Kurgo CoPilot Dog Pet Bucket Seat Cover is the perfect vehicle accessory to keep your car seats .. The NEW! Kurgo Dog Cargo Cape Cover is the newest and hottest pet cargo cover on the market! With th..
With the Kurgo Car Vehicle Door Guard Shield you never have to worry about your slobbering, window c.. The New Kurgo Stowe Pet Travel Hammock ~ Bench Seat Cover is made of a rich dura-suede material, c.. The Back Seat Dog Hammock™ car seat cover creates a comfortable hammock seat cover for your dog by a.. Enough room to store the treats & travel stuff Fido needs to remain well behaved during any road tri..
Super Quality with great style. No matter how much you love your dog, no one wants to have dog hair ..